After many years of working at the Texas Department of Public Safety, I came to realize that my forensic art experience was particularly varied and in-depth. For this reason, I felt an obligation to document information for the benefit of other practitioners in the form of a textbook. Forensic Art and Illustration was the first all-encompassing text for the forensic art field. I believe it is incumbent upon all who bear the responsibilities of criminal investigations and prosecutions to understand more about forensic art. Over the years, I have been honored by the acceptance of the book around the world. Several international law enforcement groups have even told me that the book was the basis for setting up new forensic art units within their agencies. When writing it, I never imagined the broad use it would have by professionals is so many fields. As the number of stranger-on-stranger crimes grows, solving these crimes becomes more challenging. Forensic illustration has become increasingly important as a tool for identifying both perpetrators and victims. Forensic Art and Illustration was the first book to provide complete coverage of all aspects of the field, and includes much previously unavailable information. A practical guide, it is intended for criminal justice personnel, anthropologists, artists, and others who depict faces in their work. Order Forensic Art and Illustration on Amazon. © All images and text are exclusive property of Karen T. Taylor (unless otherwise indicated). 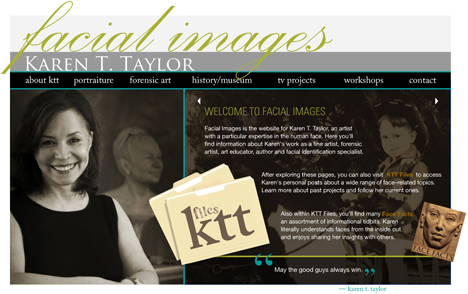 No part of this website or any of its contents may be copied, reproduced, disseminated, published, altered or adapted in any way without the prior written consent of Karen T. Taylor.